Johann Hieronymus Löschenkohl (1753-1807) was a goldsmith and a popular Viennese engraver who had already been granted a royal privilege as a fan printer. 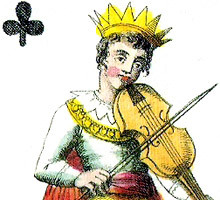 In 1806 he produced a copper engraved and daintily hand coloured deck of playing cards titled “Das Musikalische Kartenspiel”. The cards were aimed at a bourgeois public who enjoyed graphic arts which were didactic in character. The pip cards are overlaid on sheets of music, some of which are songs and some, when properly laid out, are actual pieces by Mozart. It is quite a delightful deck with court cards rendered in colouring that is close to pastel. Löschenkohl also produced a second copper engraved deck of Botanical Playing Cards. 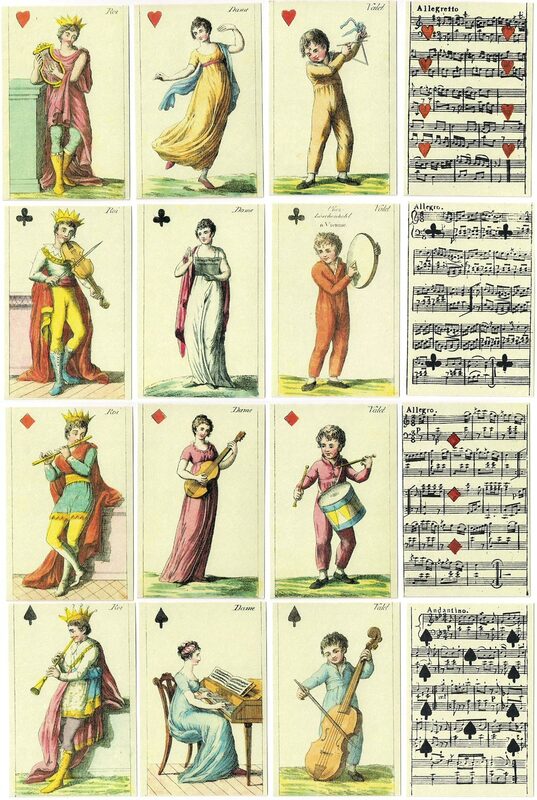 Above: Johann H. Löschenkohl's Musical Playing Cards, originally published in Vienna in 1806. Only one set is known to exist and it is housed in the Historical Museum of the City of Vienna. In 1981 Piatnik issued a numbered facsimile edition of the deck. Images from that facsimile edition courtesy Rod Starling.